Coral reefs along the Florida Keys are in trouble - with problems such as the long-term threats of runoff pollution, overfishing, invasive species, coral diseases and warming seas, and sudden disturbances like heat waves and hurricanes. However, these reefs are a vital part of the local community; responsible for more than 70,000 local jobs and worth approximately $6 billion to the local economy. Participants in Mote Marine Laboratory's Research-based After School Program for Students are part of our next generation of scientists, and they are excited to learn all they can about their local ecosystem and do their part to preserve it. 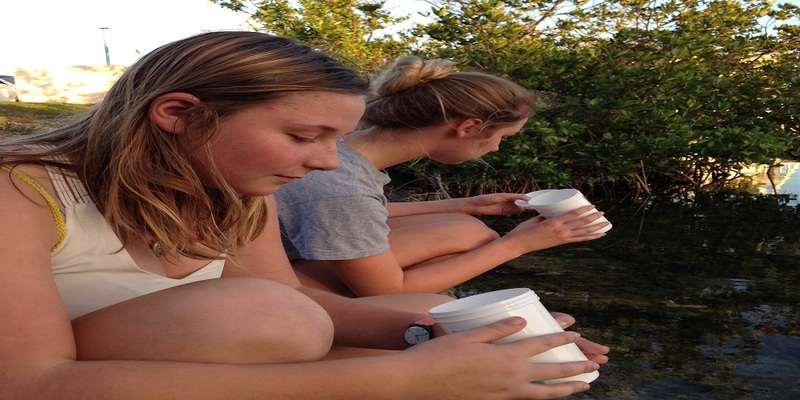 These students are working hard to protect corals through research and community outreach! They know that one of the most critical things required for coral to thrive is healthy water, and this November, they've begun to monitor local water quality conditions as part of the EarthEcho Water Challenge. Students first practiced (very carefully!) collecting their samples without introducing additional dissolved oxygen, then tested all the parameters they've been learning about. Today, everything looks healthy! Students were particularly relieved to find normal pH and nitrate levels, considering the potential for some very unhealthy conditions due to post-Hurricane Irma debris and runoff. As we enter winter, the students predict that corals will be less stressed thanks to cooler water temperatures. Just to be sure, they will continue to monitor their local waters, and spread the word about all they've learned!